Poke /poʊˈkeɪ/ is a raw salad served as an appetizer in Hawaiian cuisine. Pokē is the Hawaiian verb for “section” or “to slice or cut”. 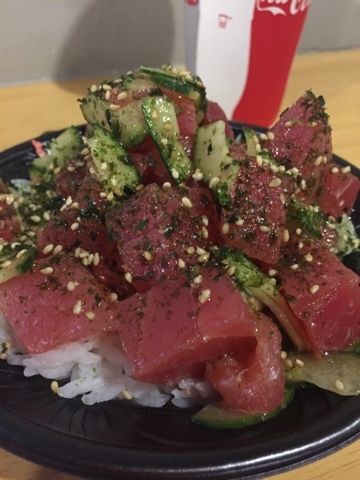 The most popular poke typically consists of cubed raw ʻahi (yellowfin tuna) marinated with sea salt, a small amount of soy sauce, inamona (roasted crushed candlenut), sesame oil, limu seaweed, and chopped chili pepper. 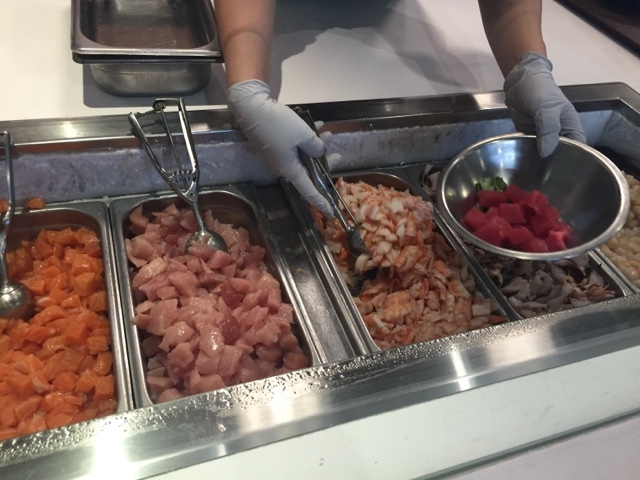 Other variations of ingredients may include cured heʻe (octopus), other types of raw tuna, raw salmon and other kinds of sashimi, sliced or diced Maui onion, furikake, hot sauce (such as sambal olek), chopped ʻohiʻa (tomato), tobiko (flying fish roe), ogo or other types of seaweed, and garlic. 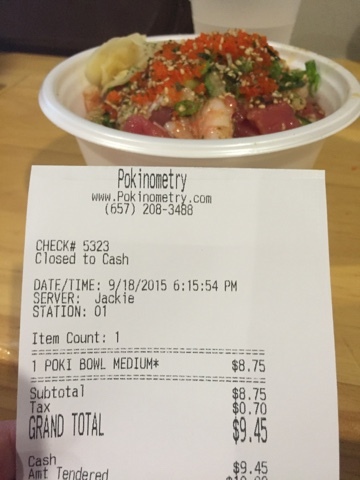 Pokinomentry is an excellent place if you are hankering for a decent poke bowl, and don’t want to shell out a ton of cash. 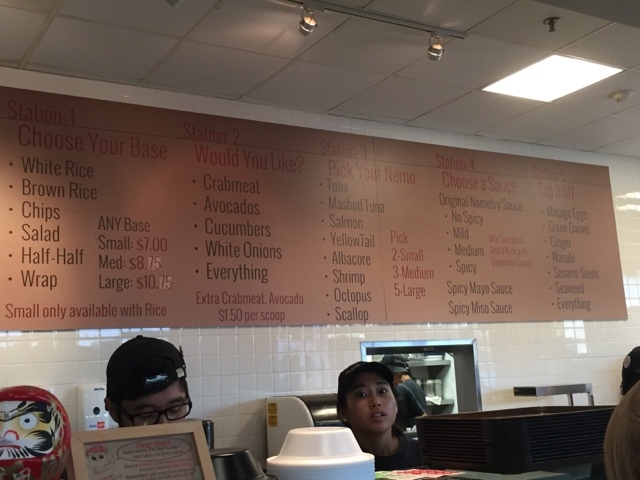 I’ve been checking out other Poke places in LA and Orange County, and by far you get more here than the other places. Most of the other competitors provide you with just 1 topping. Some offer you a free add on when you check into Yelp or Facebook. Over at Pokinometry, you don’t have to do that, because everything is included. 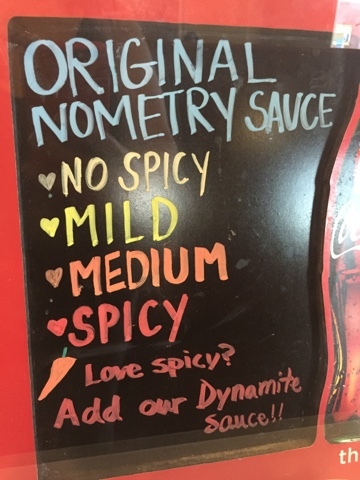 So, here’s how you order. They serve you cafeteria style, where you build you meal as you walk down the assembly line. 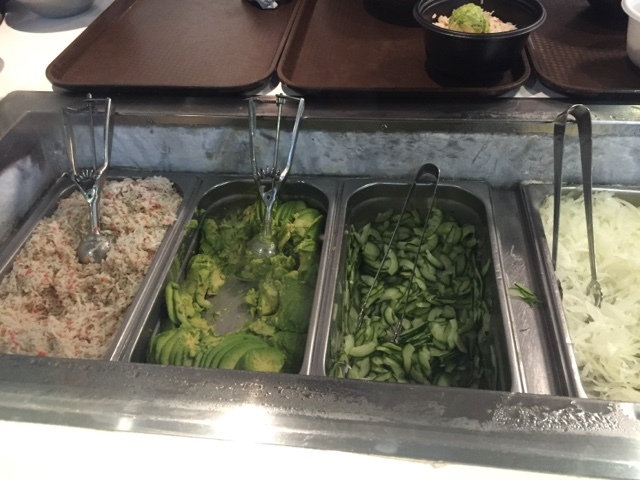 You first start off by choosing between three different size bowls (small, medium or large) with a variety of base: white or brown rice, salad, or tortilla chips. You can also make your meal into a wrap. Each bowl comes with these additions, at no extra cost. Each scoop looks a little over a 1/2 ounce, and you can mix or match your fish. 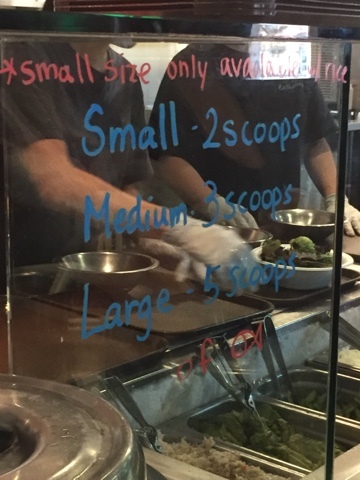 Then the bowl gets passed to next staff, who mixes your fish with the sauce of your choice, from no spice to spicy. 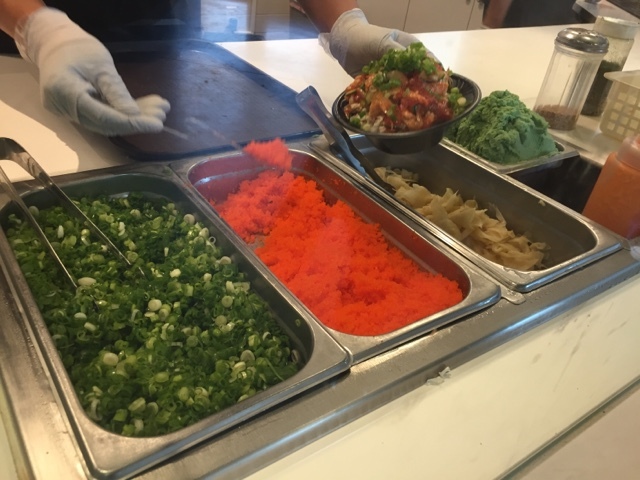 The final step is topping off your poke creation with: seaweed, sesame, wasabi, smelt eggs, and ginger…. also, at no additional charge. I do love this place, but there is the one reason I am not completely happy with this location. Seating and parking. If you wish to dine in, get here early, or during some weird off peak time. The place has 8 tables, and a string of counter seats, and it fills up fast. You can take it outside and find a park bench, perhaps across the street near the Wells Fargo. There’s some street parking outside, but the closest parking area is about a half block away across from the D-Rinks skating facilities or at the structure and its 2 hours max. 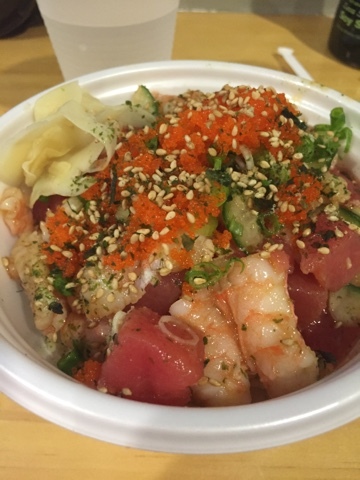 If you can overlook the tiny space and inconvenient parking, this is a great place for Poke. Anaheim Ducks (preseason) hockey starts today!